For those who don’t know Rikomagic yet, they are the company behind the MK802 series, mini computers running android that allow you to turn any TV into a smart TV. They also sell accessories for computers, and when I bought their MK802 IV, (my review here), they also suggested the MK702 II remote controller/ air mouse as a recommended accessory. On the paper, the MK702 II is a great device: Air mouse (if you don’t know what that is, think ‘wiimote’), integrated speaker and microphone to use with skype, mini keyboard, and universal infra red remote for the “old” equipment in your living room. Moreover, the device is pretty much universal. It will work on regular PCs running Windows/MacOS/Linux, but also on the PS3, or on Android devices (in my case, the mk802 IV is the reason I bough the device). 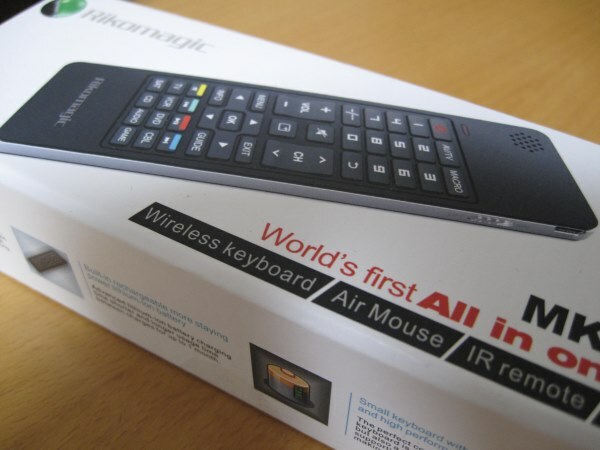 An air mouse like the mk702 II makes a lot of sense for an android Smart TV device like the mk802 IV (the mk702 II is also compatible with the mk802 III), because it is as compact as a typical TV remote, but also contains a keyboard that should be good enough in most cases for your typical android usage. The mk702 II ships in what I consider to be the typical rikomagic package: good solid cardboard package with weird English on it, but nothing that would feel cheap. The device itself is extremely compact, light, and, may I say, I like its design. 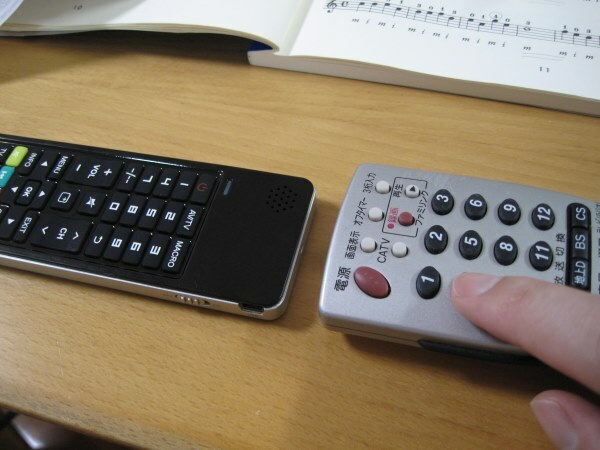 Simple but functional, it looks better than most of the remotes I have in my house, from major Japanese manufacturers. The Remote needs to be charged initially. It includes a battery and you can plug it to any usb port with the provided usb cable, to charge it. One would have appreciated a bit more from the usb connection (maybe a possibility to upload directly IR preloads?) but as far as charge is concerned, it does its job. The MK702 II connects to your device wirelessly through a USB dongle that you connect on your target machine: Android mini PC, Windows PC, PS3… the MK702 II seems pretty plug and play and compatible with a bunch of devices in my experience. Those of you who have used wireless keyboards, etc… in the past won’t be surprised by this typical wireless usb dongle system. On my MK802 IV, the MK702 II worked out of the box (besides the necessary time to charge it the first time). A quick step in the Android settings to adjust the sensibility, and I was good to go. (Note: some people might have to calibrate the air mouse – if they see that the mouse pointer moves even though they are not moving the device – ), which is done by putting the air mouse on a stable place (e.g. your table), and long pressing the Fn + mouse left click. When releasing the keys, the device should calibrate. The device feels ok in the hand, and although it was my first time using an air mouse (I don’t have a Wii either), after a few minutes I was at ease with the pointer. it is not as easy as my logitech K400, which is a real big keyboard with a touchpad, but on the other hand, the mk702 II fits in one hand and is overall less of a burden to manipulate from your couch. 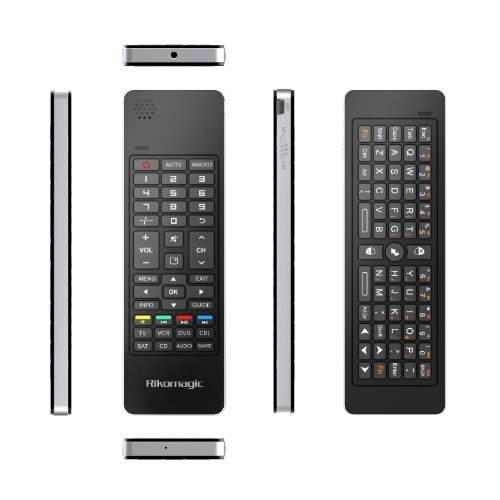 So they should be considered as very different devices with different goals, and your choice between an air mouse and a “regular size” keyboard should matter on the use you plan to make from your smart TV stick. Using the keyboard itself is a bit more painful. 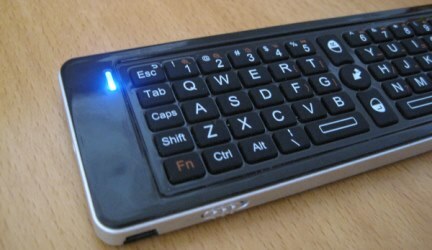 The device gets the job done, and you’ll type faster than if you had to use the onscreen Android keyboard, but it is of course much slower than using a real sized keyboard. On a side note, the keyboard does have keys for volume up and down (although accessible only through a combination involving the Fn key), which is convenient. I’ve found it more than enough to type my login and password on things such as Netflix, or to search in google, but would probably never consider using it to type and email. I’d also forget about gaming with this, this is really not what it’s for. Overall a nice experience, and that justifies for me using this device instead of the Logitech K400, as long as your Android mini TV is mostly a Media center for you, and that you don’t plan on typing much. The MK702 II integrates a speaker and a microphone. They are positioned in a way that you can hold the MK702 II to your ear like a phone, and use it in conjunction with Skype for example to make a phone call. I was initially really excited about this feature, thinking it could almost replace our regular phone in the house. Sadly, the quality of the speaker, but more importantly, of the microphone, was terrible in my tests. I should probably give it another try, as I tested this only on the MK802 IV which at the time had Wifi issues because of a bad firmware, but overall the experience was not satisfying. Another real disappointment is the lack of a jack output for the sound. To me this is a big missed opportunity from Rikomagic. With a headphones port, the remote could have been used to watch movies with earphones directly from the couch. I don’t think it would have made the device that much more expensive. Important note: for the speaker and microphone to work, the device must be running Android 4.2 or more. On 4.1 or below, the air mouse and the keyboard will work, but not the mic and speakers. This is not a limitation of the device, but of android, which introduced support for usb audio in 4.2. The “learning” function is pretty simple. You basically long pres a key of the mk702 II remote, make it face your original remote, and press the key on the original remote. The mk702 II records the IR signal of your remote, and is ready to reproduce it. Done. It’s pretty painful to do it for all keys, but once this is done, you can basically get rid of at least your TV remote. That turns out to be extremely convenient if you use the mk702 II on a TV with a device such as the mk802 IV or any other mini “smart TV” Android stick. As the question was asked to me: the IR remote keys cannot be used as shortcuts to the android device. This is simply because the “IR remote” part uses, well, infrared, while the whole interaction with Android happens through a more modern 2.4 GHz signal. Basically, they should be considered as two completely separate devices that just happen to share the same plastic box around them. It doesn’t make that functionality any less convenient, though. I was able to use the remote for a sustained amount of time. It goes in “sleep mode” automatically if it detects no activity on your end for a little while. One cycle of charge made me go through about 3 weeks of usage, but I don’t use my TV that much though. That’s to compare to the Logitech K400 which I’ve owned for more than a year now, and on which I never changed the batteries yet. So, the battery of the device is ok for what it’s supposed to do, but not insanely great. The MK702 II is a good air mouse, light, compact, with good key features and a design I like. The integrated keyboard is good enough for minimal use (enter a username and password, search for something on google or google play, the occasional tweet, etc…) but might become tedious for longer typing tasks such as writing an email. The integrated speaker and mic are just a gimmick, and not good enough in my experience for any actual use, and are the big missed opportunity of this device. The additional universal IR remote integration is a nice addon that turns out to be more useful than I initially thought to limit the number of remotes in your living room. Given its reasonable price, I recommend it for use with your MK802 III, IV, or any other Android Mini PC connected to your TV. A purchase I do not regret, as I now use the MK702 II more often than my logitech K400 keyboard. So it is a fly mouse, where is the right and left mouse buttons on this remote. Is there a play button to work with the video software like xbmc. How do you like it so far, I am looking for a good remote, nothing too fancy but has most feature to navigate computer seamlessly without much trouble, what is the best remote you found? also is the fly mouse function good, I mean does it sometimes get confused by the position to the screen resulting in hand moving further and to recalibrate, you have to go over at the edge of screen. Hi thanks for the review! Wouldn’t it be possible to use the IR ‘side’ of the remote with android using FLIRC?